ST. LOUIS (DTN) — If a thief snuck in around harvest time and made off with 30% of your soybean crop, you’d probably notice, right? Maybe not, says Iowa State plant pathologist Greg Tylka. The soybean cyst nematode (SCN), the tiny pest that infests soybean roots, is the number-one source of yield loss for soybean growers in the U.S. The presence of these tiny nematodes — a female stuffed with 200 eggs is the size of the period at the end of this sentence — can go undetected at low to moderate levels. Post-harvest conditions make an excellent time to sample for SCN, plant pathologists have noted in recent weeks. Most importantly, knowing nematode levels could make a serious change on your 2015 soybean seed selection. At current commodity prices, more growers this year are thinking of increasing soybean acreage in 2015. 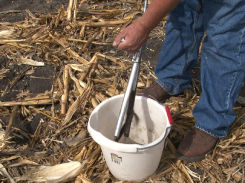 Even long-term continuous corn growers should test for SCN levels if they’re thinking of switching fields to beans. Tylka’s research has shown SCN eggs can survive without soybean roots for up to 10 years. Soybean cyst nematodes are increasingly prevalent in the Midwest. In Illinois, an estimated 80% of fields have SCN; in Iowa, that number hovers around 74%, Tylka noted. Yet many farmers deceived by healthy looking plants and decent yields have yet to test for the pest in their fields. When the pest’s numbers soar into high ranges, 12,000 eggs per 100 cubic centimeters (cc) of soil or above, plants will be stunted, Tylka explained. At low to moderate levels — 2,000 to 12,000 eggs/100 cc of soil — the nematode is more discreet. “If you’re unhappy with your soybean yields and you don’t know why, that almost is an indirect symptom of soybean cyst nematode,” Tylka said. Other risk factors for SCN include living in a state or region where the pest is known to exist, or having soil with ph levels of 7.6 or higher, which the nematodes thrive in, Tylka said. Research also suggests that nematodes can do more damage when they infest plants also afflicted by sudden death syndrome and soybean aphids, he said. Sampling for the pest can be time consuming and expensive, Tylka said. The nematode’s tiny size makes it easy to miss in soil cores, particularly if your levels are low. Plant pathologists recommend pulling 20 soil samples for every 20-acre field area where you plan soybeans. Analysis costs $20 to $30 per sample, depending on the lab, Tylka said. “It is a lot of money and a lot of work, but there is a lot at stake, too,” he said. Across thousands of acres, a 5-bushel-per-acre-loss, which nematodes can steal “in a heartbeat” from a susceptible variety, adds up pretty quickly, Tylka said. If you skip sampling, and farm in an area where nematodes are present, you can hedge your bets by planting a nematode-resistant soybean variety. Knowing actual infestation levels, Tylka said, would allow you to correctly prioritize other disease packages in seed, such as resistance to Sudden Death Syndrome. 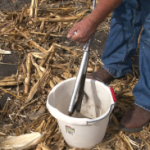 For details on how and where to sample, see Tylka’s Iowa State Integrated Crop Management article on sampling for SCN here: http://goo.gl/…. If soil samples reveal even a very low level of nematodes, act aggressively, Tylka warned. Nematodes are a prolific pest, and the numbers are likely to increase exponentially each year if not controlled. Each year, Iowa State uses soybean checkoff funds to compile a list of SCN-resistant soybean varieties. Although the list is compiled for Iowa farmers, any growers who use maturity groups 0 to III will find it useful: http://goo.gl/…. You can also see how SCN-resistant varieties performed in past years at this Iowa State website: http://goo.gl/…. Growers with extremely high concentrations of SCN should consider not growing soybeans at all for a while, Tylka warned. Crop rotation will not eliminate the nematodes, but it can lower densities. Companies such as Syngenta, Bayer CropSciences and Plant Health Care have seed treatments available for SCN, and Michigan State University tested some of them last year. You can see the university’s evaluation here: http://goo.gl/…. Using legume cover crops won’t necessarily change SCN levels. Iowa State tested a wide variety of legume cover crops in SCN-infested soils. The study evaluated Berseem clover, cowpea, crimson clover, three types of red clover, sweet clover, two types of white clover, Austrian winter peas and field peas. The results showed almost no SCN-reproduction on any of the plants’ roots, which means cover crops are unlikely to serve as hosts for SCN, Tylka concluded. Whether or not cover crops can actually serve to suppress SCN reproduction is still unknown, he added. You can read about the study and the possibility of using cover crops to suppress SCN here: http://goo.gl/….